Hi handcycling fans. 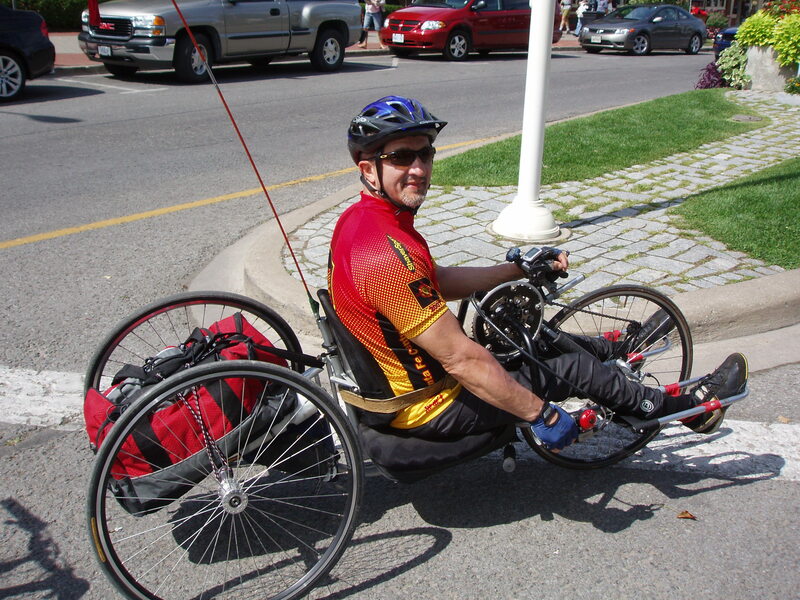 The HCC is a newly formed group (January 2013) of handcycling enthusiasts mainly from the Greater Toronto Area but we do have devoted members in the Windsor area in the west and Ottawa in the East. We want to develop as the premier handcycling organization in Canada providing inspiration, information and comradeship to all who are interested in all forms of handcycling. One of the most exciting aspects of this website is our ability to communicate with folks located in all areas of this vast country and to share our stories and experiences related to handcycling. Personally, my formative years in this sport were strictly recreational; an activity that I, as a paraplegic, could share with my wife who is not disabled. As we became fit and grew to love this activity, we soon started dreaming of cycling in unknown lands and looking forward to the excitement of being dependant only on our individual and combined strength, ingenuity and our sense of adventure. We first cycled the Waterfront Trail from Toronto to Niagara on the Lake and Niagara Falls, and the following year we drove across the border to cycle the beautiful roads of the Finger Lake region of New York State – I carried our luggage strapped to the rear axle of my bike and my wife pulled a two-wheel trailer loaded with my wheelchair. We agreed that both trips were great and we want to do more of these but we yearned for more “exotic” and distant places so we found a bicycle travel company and booked a trip to cycle the circumference of the Island of Hawaii – we absolutely loved it! Since then, we cycled New Zealand, Costa Rica, New Mexico, Utah and Arizona. This year we are looking forward to tackling the mountainous roads of Northern California. Active bicycle vacations are the best. Last year, I purchased my first race-ready bike and entered three races to discover another exciting dimension of handcycling. In April of this year, I’m planning to race in the Toronto 10Km race and in Montreal at the Defi Sportif. My wife has already selected several triathlons she will compete in so 2013 is shaping up as an exciting and busy season. This past September I began handcycling. Most challenged athletes enjoy the marathons and triathlon events but I encourage newcomers to learn about the sport in the 5K events. I have so often been the only handcycle in these races but my times have been steadily improving and racing against yourself is great too. It is almost a sprint race and is equally rewarding. I am doing 3 events on race weekend to bring my race total to 10 just since January. I sure hope you all come out and to see you there.